No. 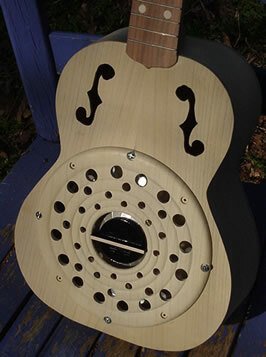 26 Concert Resonator- Magnolia body with blue/black milk paint, cherry resonator, walnut biscuit cover, Honduran rosewood fretboard, apricot headstock veneer. 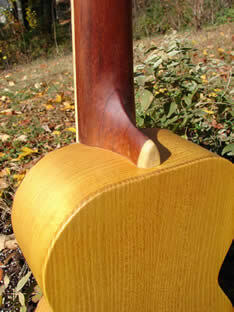 National cone, Deluxe friction tuners and horn nut. This was an interesting experiment. 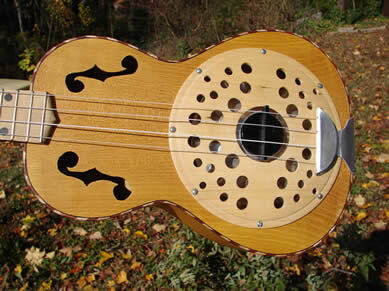 My buddy Michael and I have found that "less sound hole" delivers a purer sound with fewer overtones. With no sound hole, this uke would have been an excellent choice to record with. However, I wanted to strike the balance between recording and performing and I think this simple sound hole is just the ticket. No. 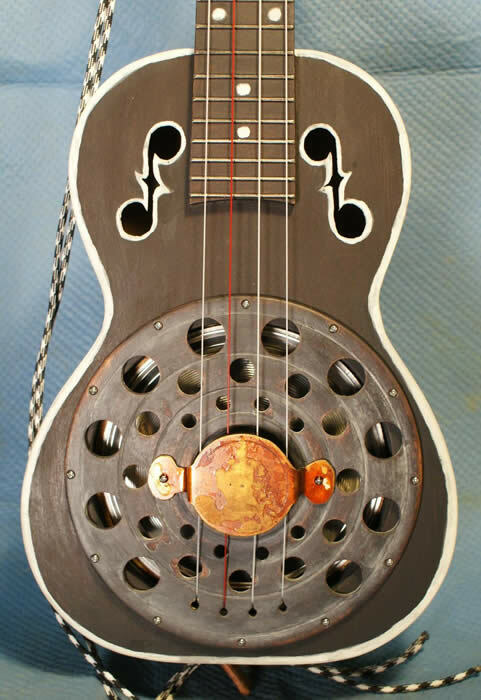 25 Concert Resonator- Sycamore body with brown/black milk paint, cherry resonator and biscuit cover, ebony fretboard, padauk headstock veneer. National cone, Peghed tuners and horn nut. Check out the matching bug holes on each side. Resonator cover is decorated with palmetto trees. No. 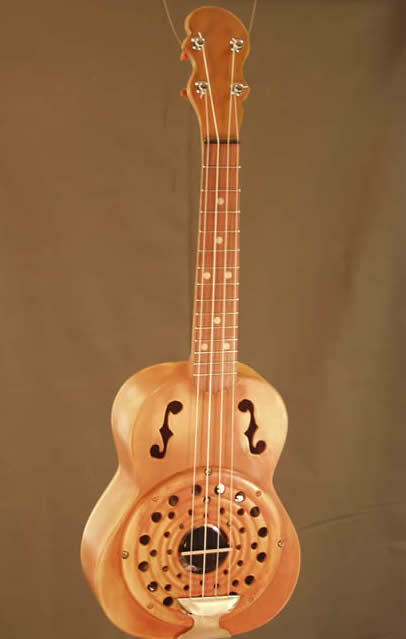 23 TallBoy Concert Resonator- Concert body with a tenor neck gives you a little more room for your fingers while maintaining that plunky ukulele sound. 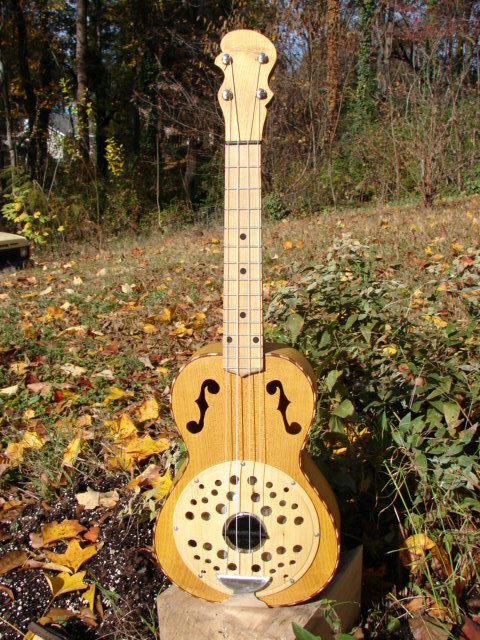 Walnut body and neck, cherry resonator and biscuit cover, dogwood fretboard, rope binding and zebrawood headstock veneer and heel cap. No. 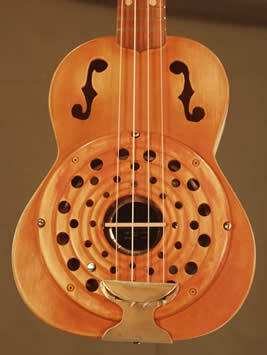 22 Painted Tenor Resonator- Thought you might like to see some photos of my latest ukulele. Caleb in Oregon ordered this one and I think it really came out well. He wanted a painted body and natural wood for the other parts. 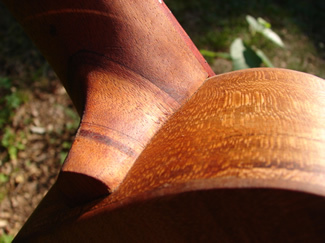 The body is poplar painted with dark brown and black milk paint. 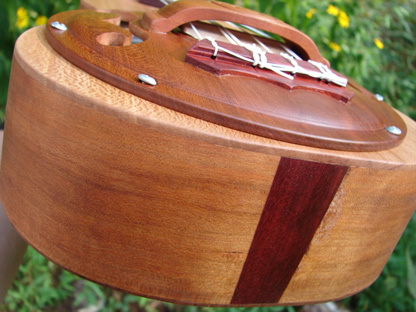 The neck is mahogany and the resonator cover, biscuit guard and fretboard are walnut. He also flattered me by choosing my old f-hole design. I always like that design but I didn’t know anyone else did! Mahogany body and neck, Honduran Rosewood fretboard, Magnolia resonator cover and sound portals, aluminum tailpiece and biscuit cover. Walnut back, sides and top, cherry resonator cover, curly maple headstock veneer, ebony fretboard, mahogany neck, maple binding. Aquila strings, planetary tuners with ebony buttons, horn nut, Beard 10" cone. No. 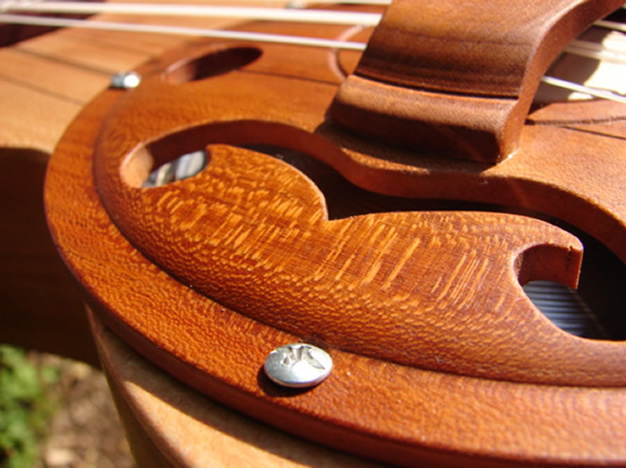 17 Hurricane Model- National Hurricane symbol for soundholes and counter-clockwise spin on resonator cover. Cherry back, sides, top, resonator cover and headstock veneer, ebony fretboard and tailpiece, mahogany neck, walnut and white wood binding. 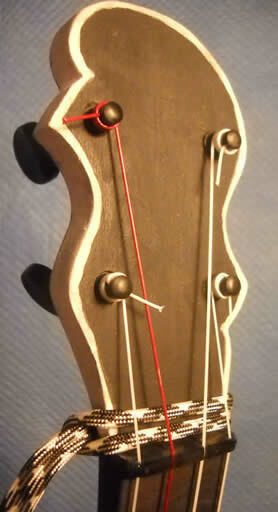 Aquila strings, deluxe friction tuners, horn nut, National cone. Smithers bombing my photo shoot! No. 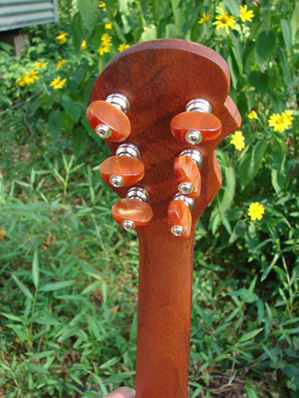 15 - Cherry back, sides and resonator cover, tiger striped maple top, walnut headstock veneer and end graft , persimmon fretboard and tailpiece, mahogany neck. Aquila strings, Peghed tuners, MOP fret markers and National cone. **Please note - I have replaced the biscuit cover to the one above. Other than that, ukulele is the same as the photos below. No. 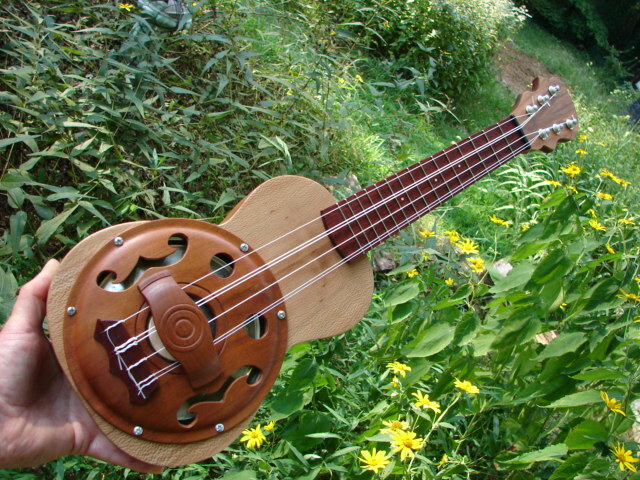 16 - Sycamore body and headstock veneer, ebony fretboard and end graft,mahogany neck and figured walnut resonator cover. Aquilas with a red low G.
Air-dried walnut is so much more colorful than kiln-dried. *sold* Thanks Robert and Ann!